We arrived at school this morning on the day of our trip away, feeling excited about the adventures and challenges that lay before us. After a short stay at school, we were soon getting on the bus and happy to be on our way. Upon arrival we stored our bags before heading into the sports hall to enjoy our lunches. After some refreshment we were ready to explore the site. We took a long walk all around Kingswood and were introduced to many of the activities we would soon be enjoying. We couldn't wait to get started, but first we went to find where we would be sleeping and had to face the challenge of making our own beds! Once our rooms were ready, it was time to start the day's first activity: Archery. Here we learnt how to hold and shoot a bow and arrow. We enjoyed having a go and were proud of our efforts no matter how we did. To finish the session we took part in a competition where using only one arrow we had to hit the target. Wherever we hit on the board would decide the cutlery we had to use to eat our tea! Unfortunately for many of us we hadn't quite fully mastered the challenge, and having missed the board completely, were resigned to eating our tea using only our hands!!!!!!!! Luckily we think the instructors were only joking! 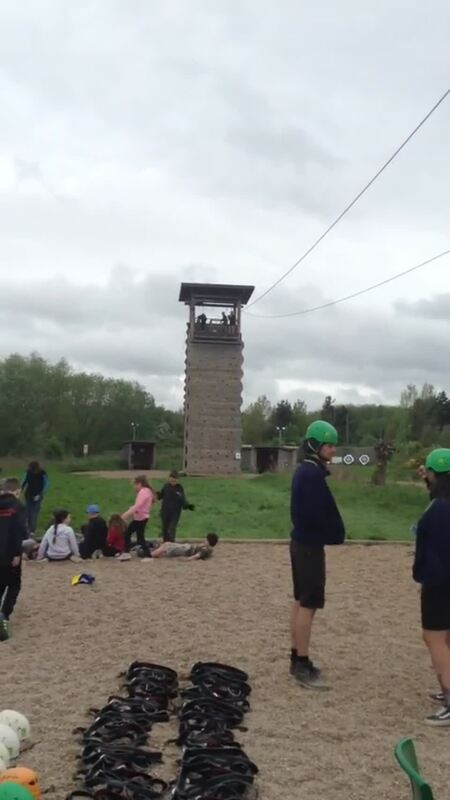 After archery we put on helmets and harnesses and took part in the crate stacking challenge. Here we had to help our friends climb higher and higher by building a tower of crates for them to stand on. 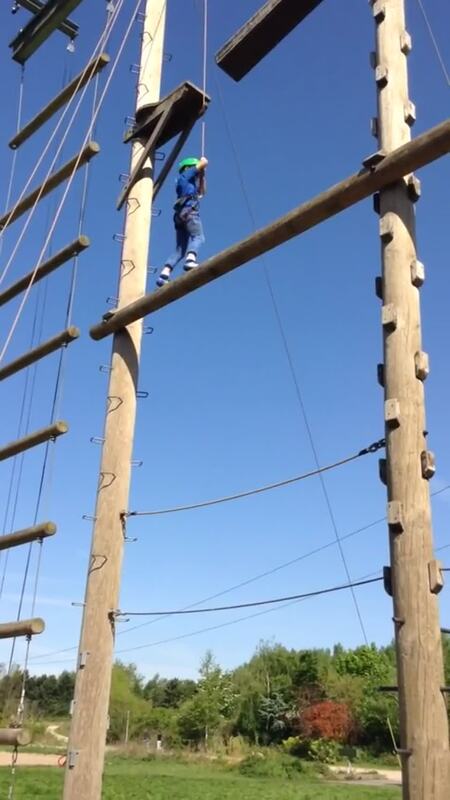 It felt quite scary when perched on the top, but we all had a go and really enjoyed sending the crate towers crashing down as we swung from the ropes. After a tasty tea of lasagne or chicken and a chocolate brownie, which we found hard to believe contained beetroot, we returned to our rooms for a brief rest before heading off to enjoy a campfire. Here we had lots of fun telling jokes and riddles as well as singing lots of songs. Its been a busy first day here at Kingswood but now it's time for bed. We've had lots of fun already but can't wait to see what adventures await tomorrow. Sleep well everyone - after our busy day we certainly will. Well that's what our teachers hope anyway! It's day two and we are ready to go. First for a tasty breakfast to give us a good start to the day. After breakfast we returned to our rooms to prepare for the day and then we were off. The first challenge of the day being on 'The High Ropes.' This was the scariest activity we had done so far! Here we had to climb along a series of obstacles, each one higher in the air than the last. Everyone tried their best and made themselves feel proud by climbing a little higher than we thought we could. After high ropes we were quite pleased to stay a bit nearer the ground for our second activity. 'Obstacle Challenge' proved a quite different test. Here we had to make our way around a course of puzzles that could only be solved by great teamwork and communication. It was much trickier than we first thought it was going to be. After a tasty lunch to refuel we once again had to put our communication skills to the test. In 'Night line' we were challenged to make our way around an obstacle course but this time we were all blindfolded! We quickly learned the importance of sticking together as a group as well as how talking about the challenges we encountered could help the others who followed us. The scariest parts were the spiders that brushed passed us along the route and dripping water which fell from the trees. Of course due to the blindfolds we didn't see any of these things but our teachers assured us they were there, and they wouldn't make it up would they? In 'Laser' we enjoyed the opportunity to take on our friends using special guns and hats equipped with sensors. There were lots of places to climb and hide as we tried to hit our friends with our guns beams before they got us. 'Aeroball' saw us playing a game that was a bit of a mixture of tennis, basketball and trampolining all rolled into one. Jumping as high as we could on a trampoline to see over a net, we had to try and throw a ball into a target in our opponents zone. It was a huge amount of fun but very tiring. After tea we were starting to feel the effects of such a busy and action packed day but we had just enough energy left to spend the evening at the disco. So dressed in our party we clothes we danced and played games enjoying the lights and music in the Kingswood Disco! Were safely in our rooms and settled now with the last of our energy reserves depleted. But just before our weariness takes over and we fall asleep we just want everyone to know we've had a great day. It's the last part of our adventure tomorrow but there's still plenty of fun for us to have. We're looking forward to seeing you all soon with plenty of stories to tell. But for now it's good night from us all. After a good nights sleep we were ready for the last day of our adventure. So after our bags were all packed for home and we had eaten a hearty breakfast, we were ready for our final two activities. First up was one we had particularly been looking forward to the zip wire. Here once again we needed to wear helmets and harnesses before climbing to the top of a tower to begin the ride. Despite how tall the tower was, getting to the top proved to be the easy part but stepping off the top took all of our courage. But we loved sliding down the line and were hugely proud of ourselves for doing it. Our final activity of the visit was to develop our survival skills in bush craft. Here we split into two groups to complete different challenges, with half of us looking at how to build shelters and the other half exploring how to start fires. Both these tasks required team work either to collect the resources we needed or to work together to create a stable structure. Both were a lot of fun and we felt proud of our success in each. After a final meal in the dining hall the sad time came where we had to say goodbye to Kingswood and return back home. We have all had a great time and over the past few days have done many things to make us proud of ourselves. We have had so many adventures and can't wait to tell you all about them. We just may need a good nights sleep first. We may have come home tired and we may have come home dirty, but we have certainly all come home happy.